The geometric localization technique (Pizzo and Biesecker, Geophys. Res. Lett. 31, 21802, 2004) can readily be used with Solar Terrestrial Relations Observatory (STEREO) Space Weather Beacon data to observe coronal mass ejection (CME) propagation within three-dimensional space in near-real time. This technique is based upon simple triangulation concepts and utilizes a series of lines of sight from two space-based observatories to determine gross characteristics of CMEs, such as location and velocity. 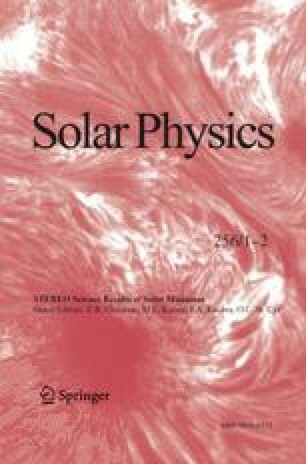 Since this work is aimed at space weather applications, the emphasis is on use of COR2 coronagraph data, which has a field of view from 2.5R ⊙ to 15R ⊙; this spatial coverage allows us to observe the early temporal development of a CME, and hence to calculate its velocity, even for very fast CMEs. We apply this technique to highly-compressed COR2 beacon images for several CMEs at various spacecraft separation angles: 21 August 2007, when the separation angle between the two spacecraft was 26°; 31 December 2007 and 2 January 2008, when the separation angle was 44°; and 17 October 2008, when the spacecraft separation was 79°. We present results on the speed and direction of propagation for these events and discuss the error associated with this technique. We also compare our results to the two-dimensional plane-of-sky speeds calculated from STEREO and SOHO. Guest Editors: Eric R. Christian, Michael L. Kaiser, Therese A. Kucera, O.C. St. Cyr. Pizzo, V.J., Biesecker, D.A. : 2004, Geometric localization of STEREO CMEs. Geophys. Res. Lett. 31. doi: 10.1029/2004GL021141.